If you work at home, it's important to get out from time to time to reconnect with the world, get groceries, etc, but never for too long, 'cause the Second Life cat-people scene moves pretty damn fast. 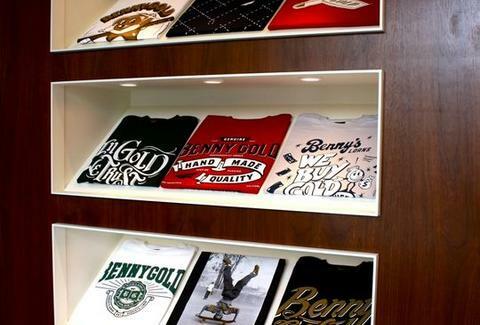 Gladly leaving the home-office behind, streetwear vet Benny Gold. Because BG got sick of doing it all at his house, he scored a bi-level Mission space that serves both as his design workshop (upstairs) and retail showroom (downstairs), where the shelves'll be stocked with only the most current duds from his eponymous line, which'll invariably be tinged with the nostalgic immaturity that's Benny's hallmark, and actually, Hallmark's hallmark. Spring/summer begins with tees and fleece crewnecks n' hoodies that feature fresh graphics that range from cheeky (A lil' diamond ring character beckoning "We Buy Gold"), to photographic (a kid hand-standing on a skateboard in black & white, whose shoes're/skate wheels're gold), to financially conservative, with smooth script lettering that proclaims "In Gold We Trust" -- try giving it to William Jennings Bryan and he'll be all "I am not wearing this". 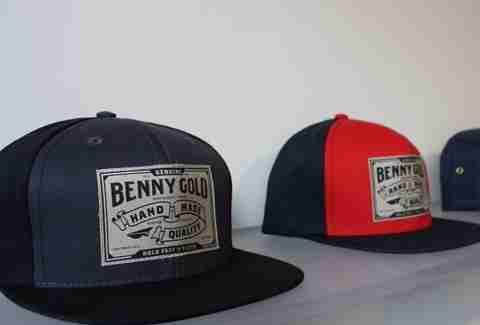 Also new're a sweet series of caps, including five panel jobs in black n' navy done up with subtle grid patterns, to black n' red snap-backs with BG's signature rendering of a toy glider, to black n' white truckers embroidered with circular seals that say "Knowledge is Golden", preferable to the alternative "Ignorance is Whatever". Rounding out S/S're a glass case full of accessories, like ribbed canvas "Scout" belts with polished gold, die-cut buckles (sporting BG's other signature image, a paper airplane), and branded blocks of skate wax, which won't be particularly useful if you work. At all.